This outstanding Clark cabin is the ultimate destination spot for a large family or group of friends looking to experience northern Colorado and the Steamboat Springs area. Nestled among the trees on a secluded property, enjoy the peace and quiet after an eventful day of skiing, exploring downtown, or soaking in the hot springs - all about a 45-minute drive away. The luxury vacation rental boasts 5 bedrooms, 4 bathrooms, gorgeous wood paneling, an indoor hot tub, incredible views, and much more! With a house as magnificent as this one, you'll be tempted to not even leave the property! 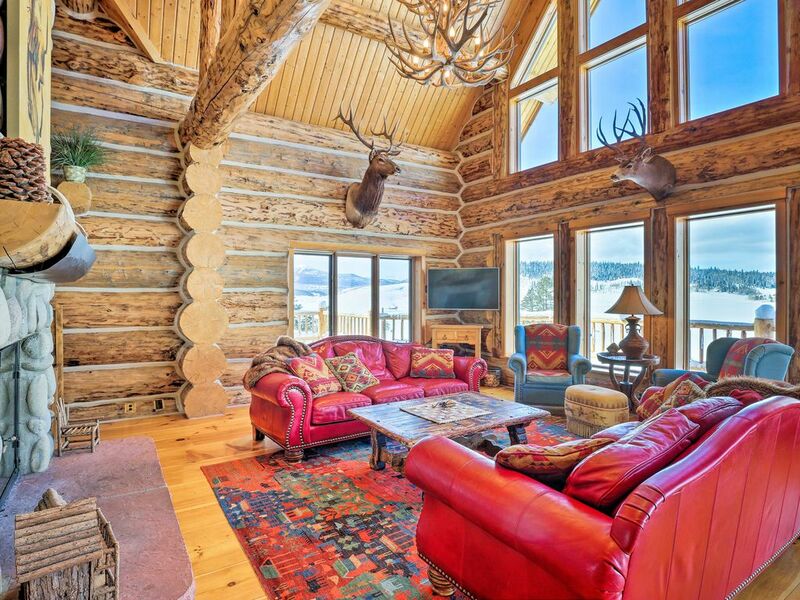 This truly luxurious home sits 30 miles past Steamboat nestled in the woods. With no other properties in sight, you'll relish the tranquility the cabin offers just as much as the breathtaking mountain views. Over 5,000 square feet of tastefully decorated living space defines the cabin's interior, which is characterized heavily by beautiful authentic wood furnishings. The living room is centered by a gorgeous floor-to-ceiling river rock fireplace and features rows of mountain-facing windows. Sip your morning coffee on the sleek red Western couches as the sun pours inside, and open a bottle of wine by the fire while the stars twinkle outside! Even with large groups of up to 18, meal prep should be convenient in the fully equipped kitchen. With new stainless steel appliances, a large center island, plenty of kitchenware, and a dining table set for 10, many memorable family feasts are in store. Put the kids to bed and head to the indoor hot tub room, complete with a sauna, wet bar, and mounted flat-screen TV. This space is ideal for watching a sports game, socializing with your traveling companions over drinks, and of course soothing your post-ski muscles! Five highly appointed bedrooms await your crew when nighttime falls. A master with a king bed, 3 bedrooms with plush queen beds, and a bunk room ensure peaceful slumbers for everyone. Restore your energy and look forward to another day in mountain paradise! Secluded among towering trees and nearly as tall snow banks during winter, the property opens up to provide unobstructed views of the Rockies! Wind through majestic roads for about 45 minutes south to reach downtown Steamboat and the ski resort. Steamboat Ski Resort spans nearly 3,000 acres and offers 165 trails for you to explore via alpine skiing, snowboarding, snowshoeing, cross-country skiing, tubing, sleigh rides, snowmobiles, and more! Summertime travelers, don't worry - the same trails allow prime hiking, mountain biking, and horseback riding. You can also hit the Yampa River and soak up the Colorado sun while fishing, kayaking, canoeing, or rafting. A trip to Steamboat Springs wouldn't be complete without experiencing the natural hot springs for which the city is named! Strawberry Park Natural Hot Springs is about 1 hour away, and the more family-friendly Old Town Hot Springs is downtown about 45 minutes from the cabin. Steamboat Lake State Park is only 5 miles away, offering a wide array of activities for all travelers and seasons. During winter, the park has about 12 miles of groomed trails in addition to acting as a gateway to nearly 150 more trails in the Routt National Forest! Most of the park is also available for off-trail riding, as are the hundreds of thousands of acres of surrounding the National Forest. Steamboat Lake offers excellent opportunities for bait, lure, and fly fishing during summer and ice fishing in the winter. (The bag limit is 4 trout daily with a possession limit of 8 trout total.) This beautiful 1,053-acre reservoir provides a variety of water-based activities including wake boating, water skiing, jet skiing, and more. You can register motor and wind-powered vessels at the Visitor Center. More outdoor adventures await at Pearl Lake State Park, where just a few miles down the road, it feels like an escape into the backcountry of Colorado. This peaceful park sits in a serene lakeside setting and boasts excellent fly and lure fishing for native cutthroat trout. Paddleboarders clamor for a chance to launch on Pearl's expansive and still waters. A trail takes visitors along the shoreline and leads them deep into the Routt National Forest, and picnicking here is picture-perfect. This is a true escape from the day-to-day routine!